This fun and easy-to-use ruler makes quick "on-point" diamond quilts with no Y-seams. An added bonus is the border is sewn on while constructing the quilt top! Ruler has lines for strip piecing as well as 1/4" markings on the X axis and Y axis for cutting the inset outer border pieces. 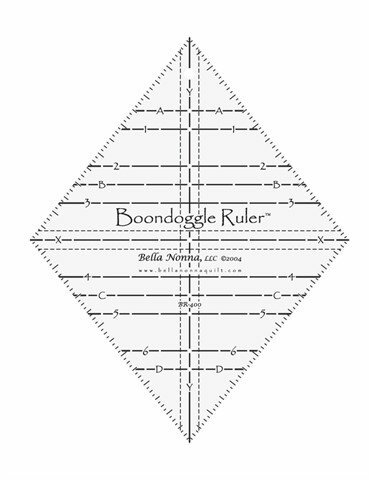 Boondoggle Ruler size: 11" tall x 8-3/4" wide. A finished boondoggle block measures about 10-1/2" x 8-1/4".